The Port of Gustavia, now one of the most photogenic in all the Caribbean, before 1950 was just a small village with a few homes, a handfuil of businesses and several Swedish buildings in ruins. The increase in tourism In the 1980s prompted the municipality to develop and modernize its harbor facilities. As you can see, the results were outstanding. 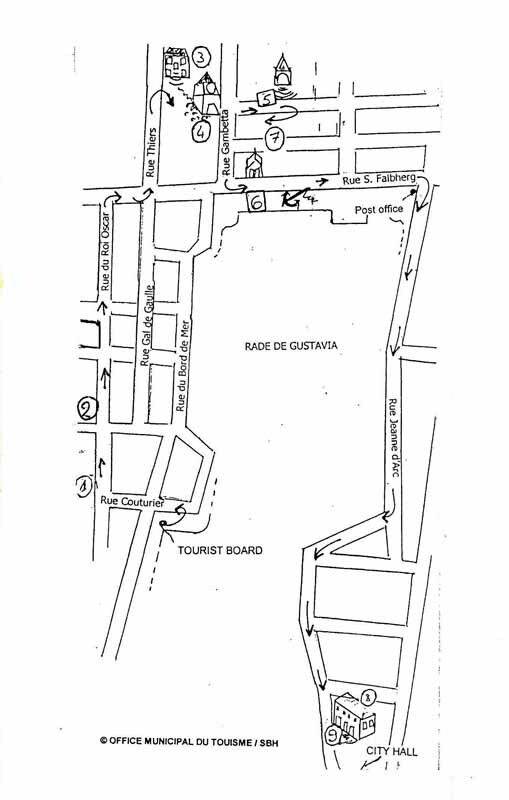 There are a total of 9 stops on this walking tour, which circuits the main section of Gustavia Harbor. Start from The Tourist Office, taking Rue Couturier to Rue du Roi Oscar (King Oscar Street) and the first stop, the Former City Hall. All 9 locations with links are listed at the end of the following map.